The Twilight Zone star discusses the episode "Replay," and dishes on her childhood crushes growing up in showbiz. The hosts of The Talk took a trip to The Twilight Zone when guest Sanaa Lathan shared a sneak peek at her upcoming episode of the anthology series titled "Replay." Visiting Jordan Peele's reimagined Twilight Zone was certainly an eerie experience for Lathan, but then again she grew up in the television industry with her father, esteemed director and producer Stan Lathan. Lathan shared with hosts Sheryl Underwood, Carrie Ann Inaba, Sharon Osbourne, Eve, and Sara Gilbert that even her first childhood crush was a surreal experience. Says Lathan, "My first [crush], I think, was Billy Dee Williams. I was like five years old... [My father] took me over to his house to play with his daughter, we were around the same age, I was just like, even at that young age, I was like 'Oh, my God.'" But it wasn't because she was starstruck that Lathan felt endeared toward Williams. She goes on to explain, "He had this, I don't know if it was a Cadillac, but he had this beautiful big car with a furry steering wheel. You know, I was five, and I was like I want a car with a furry steering wheel when I grow up... It stayed in my mind for years!" Whether she grew up to find her own furry steering wheel, Lathan doesn't say, but the hosts of The Talk were treated to a sneak peek of Lathan's latest role in CBS All Access original series The Twilight Zone. Lathan stars in Episode 3, titled "Replay," where she plays a woman on a road trip to move her son into college. She captures this momentous life milestone with an old family camcorder but soon discovers the device is capable of rewinding through time. On why she was compelled to join the series, Lathan said, "Jordan Peele is producing and I'm a huge fan of his." But it wasn't just the clout of the respected horror director; Lathan was thoroughly impressed with the story. "As soon as I read the script, I was like, I gotta do this because it was just so beautifully written," she gushed to the hosts. Lathan was careful not to give away too much about her episode—after all The Twilight Zone is best experienced for oneself—but she did express how powerful the episode is, describing it as "chilling." 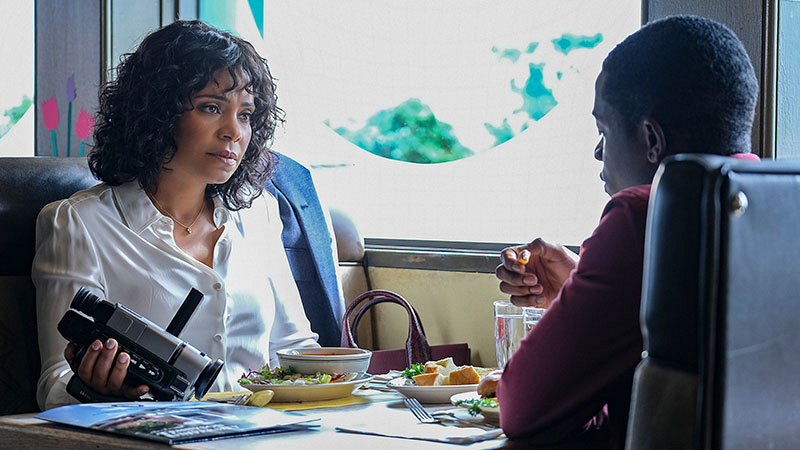 Catch the first two episodes of The Twilight Zone streaming now on CBS All Access, and look out for Sanaa Lathan in Episode 3 ("Replay") on Thursday, Apr. 11. And, watch all-new episodes of The Talk Weekdays on CBS and CBS All Access.